Since I have already invested eighteen years of my life with this man and he is the one who kills the spiders that get inside the house. I decided to come up with a different blog name. My friends are all the time telling me, if the evil world had a Martha Stewart it would be you. That is the direction my mind went to find another blog title, so later that day ‘The Pinteresting Life of Gotha Stewart’ was born. That being said, today’s post is not even about a pin I saw on Pinterest, (oh the horror). This is a pin I, myself pinned. It was just a photo of the finished project that I uploaded to Pinterest. Since several people have asked me how I made it, I decided to share the how-to. We have this giant oak tree in out back yard, I call him the mighty oak. Yes I do talk to him. If I don’t he throws acorns on me as I try to relax and read in his shade. Mighty oak tends to lose limbs during bad thunderstorms. One day while picking up limbs after an extremely bad storm I picked up this one good size stick. The first thing that entered my mind was, Gandalf from LOTR. I turned to the husband, shouted, “You shall not pass!” then struck the earth with the bottom of the stick. The husband looked at me, shook his head and said, “to bad it’s not a broom, you could fly off.” Oh he thinks he is funny. He’s not. The mind started working. I saw this stick transformed to a magical staff any sorcerer or sorceress would be proud of. I already had all the items on hand. Except eye of newt and tongue of goat. I began working naked under the light of a full moon, not really, it was full sun and I was fully clothed. Since we just experienced a bad storm the night before I had to lay the stick in the sun to dry. This took a few days. I did almost all the work on this project outside, due to messiness and chemicals used. After drying I used a flat head screw driver to scrape off the bark. My plan way to scrape all the bark off, cut off any lumpy bumpy places and smooth the whole thing down. I decided against that after realizing all those things were what gave the stick character. I did remove the bark and sandpaper from places where I was going to burn symbols. This took a week, mainly because I was working a lot of hours at the time and was hardly home. I must warn you, there could be tiny bugs coming out of the stick as you work. The stick at one time was a living limb that housed living things. Nope, not creepy at all. 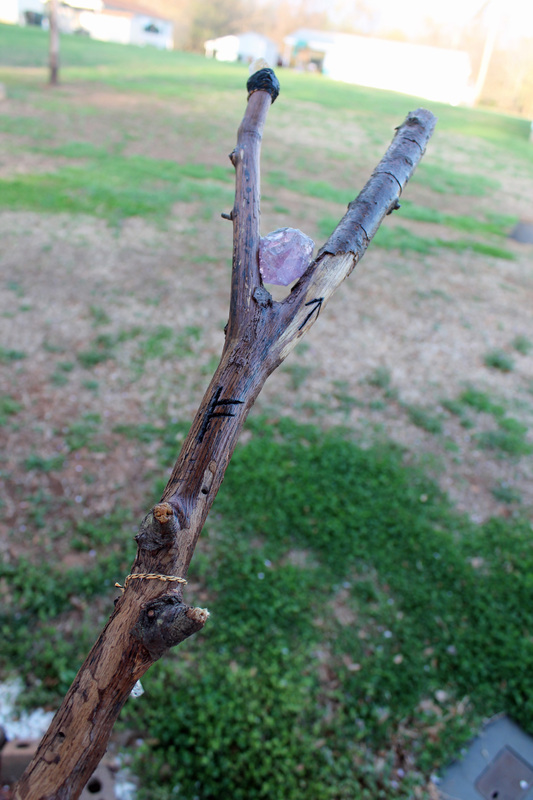 With the sharpie I drew the symbols I wanted on the stick. Using the wood burning tool I burnt those symbols into the stick. Some symbols I had to burn a few times to get them deep and dark enough to be seen. FYI this is not a project for children, unless they are enrolled in Hogwarts, even then they would still need adult supervision on this project. Once the symbols are burnt you can now stain the staff. At this point I feel it should no longer be called a stick. I used a paper towel to apply the stain, I only stained a few places. I wanted the staff to have a used well worn look and feel. Once you have the staff looking how you want it. Now get out your can of spray sealant and spray away. I did several coats. Let each coat dry completely before applying the next. Now is time for gemstones. A few years ago the husband and I took a day trip to the mountains. We stopped at a roadside gem mining stand. You buy a bucket of rocks, sit at a flume with running water, use container with a mesh like bottom and proceed to find gemstones. We ended up with a huge bag of gemstones. 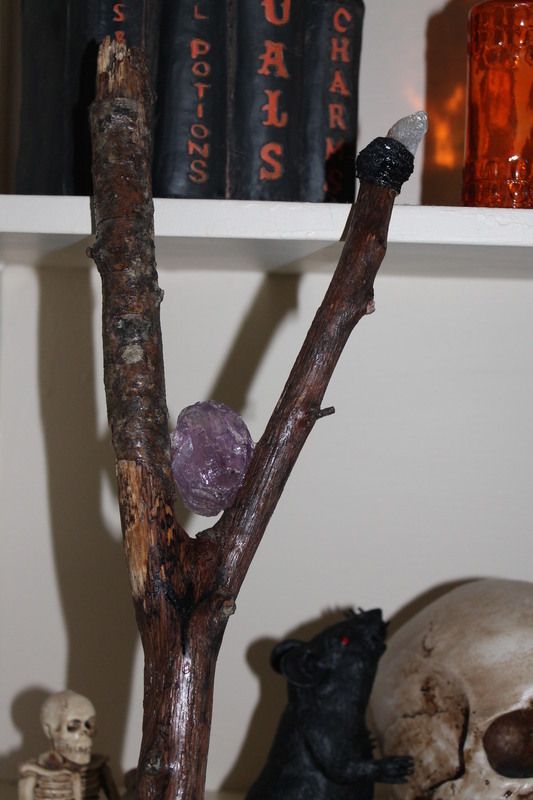 I played around with placing gemstones in the ‘fork’ of the staff until I found the perfect one. I then used craft glue (E-6000) to glue it in place. This stuff has a strong smell. Make sure you are outside or in a well ventilated area. I then glued a pointed stone to the tip of one of the ‘prongs’. That area was not the most secure place and the glue did not have much area to grab onto. So I applied glue the bottom end of the stone and the first inch of the stick then I wrapped cooking twine where the glue was applied. Once completely wrapped to my liking I started dabbing more glue on the outer part of the twine. Once dried I was not happy with the look of the twine, it was orange and black striped. I had this dark purple nail polish that was left in my car. The heat had thickened it up to the point I could not use it as fingernail polish. I coated the twine in it. To finish it up I tied a bundle of charms to the staff. I went overboard with the charms. I will probably take most of them off and just settle on three to leave dangling. I will also use a different color twine to tie them with, maybe a solid color. So there it is. The making of a magical staff. It is now ready to use as a magical prop, or to dazzle your friends at conventions or banish a demon hiding under a dwarfed mined mountain. I wish I had taken photos of the whole process. As I sit here typing this the wind is picking up outside, maybe a storm is blowing in. If the Mighty Oak loses another awesome limb maybe I will make another magical staff and take pictures of the process this time. I hope this has inspired the magical person inside you to make you own staff if so, please share your experience and photos with me. Thanks for visiting now off you go, there’s pins out there in need of pinning!